Eight-year-old Chunam Kumari's face is plastered all over the northern Indian state of Bihar in posters campaigning against child labour. Nothing surprising about that - Chunam was picked by the United Nation's Children's Fund (Unicef) to be their poster girl in an awareness campaign about child labour in this impoverished state. What is surprising is that Chunam continues to work 12 hours a day at her father's ramshackle roadside food stall in the capital, Patna, cleaning creaky wooden tables, washing utensils and serving up cheap meals. Last month, a new law came into force nationwide banning children under 14 from working as domestic servants or on food stalls. It also prevents children from working in teashops, restaurants, spas, hotels, resorts and other recreational centres. Critics warned that the problems in enforcing the law were immense. Chunam Kumari is an example of that. In the Unicef poster, in which she appears smilingly in a yellow flowery frock, Chunam appeals "for no more child labour as this age is to read and keep growing". But like her two brothers and six sisters, she has never been to school. The makeshift food stall where she helps her parents is almost next door to the offices of Bihar's ruling parties, the Janata Dal (United) and Bharatiya Janata Party(BJP). Chunam's father, Baleshwar Das, says nobody took his consent for using his daughter's photograph for the campaign. "We are poor, illiterate people struggling to make ends meet," he says. That is disputed by Unicef's communications officer Meital Rusdia. She says Unicef has Baleshwar's consent in writing with them. "We are going to try to meet him to try to get to the bottom of this," she told the BBC News website. Asked whether it was ironic that a girl used in a campaign against child labour was still working, Ms Rusdia says: "I don't think so. 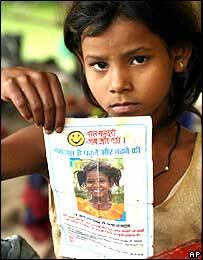 In fact the girl put on the poster by Unicef was the true face of about 2.3 million children in Bihar who could not go to school." Some critics have suggested that Unicef itself should be doing more to help the girl. But Unicef says that the rehabilitation of child workers is not its job. "We would like to emphasise that we sought to raise awareness through the [recently concluded] campaign and, being a technical agency, we don't run or own institutions to rehabilitate child labour," says Ms Rusdia. Oblivious of the furore, Chunam continues to work hard at the eatery - and giggles every time she sees her face on a poster. India has more than 12.6 million child workers, many of whom are employed in the food and hospitality sector. Many parents say crippling poverty forces them to send their children, sometimes as young as five or six, to work in other people's homes or in factories. Most of these children are made to work in unhealthy conditions for long hours and paid poorly.